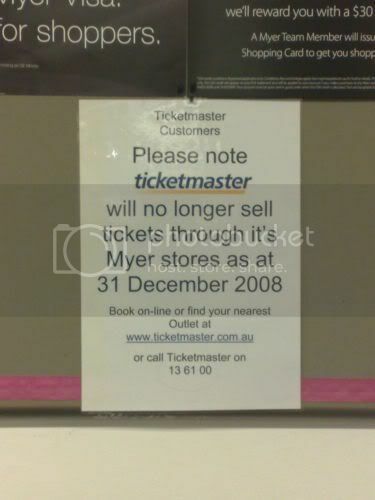 Here’s a notice from the friendly people at Highpoint Myer that will either a) invoke your curiosity, b) have you laugh at the staff’s inadequacy or c) all of the above. Obviously written by a staff who hasn’t completed high school. Or worse, an adult who doesn’t know what a pen and paper is anymore. There’s a reason why I loathe reading forums these days. Kids no longer know how to write with a pen and spend more time ‘writing’ with a keyboard. Or worse, a mobile phone. Clearly, the standard of English drops with the advent of ‘l33t’ (elite) speak. In an unfortunate by-product of the shortening of common words to fit the 160 spaces for short text messaging, grammar is compromised. Oh how I wished kids these days know the difference between ‘there’, ‘their’, ‘they’re’, ‘your’ and ‘you’re’. But that’s just the tip of the iceberg. By the way, how many mistakes can you count on that notice? I count two.